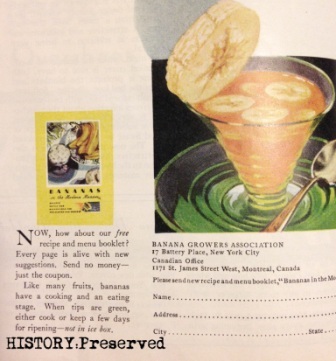 Today's banana recipe sounds pretty good! Super fast and easy - any of you could try it, no problem. Aren't you excited?! Actually, I think I'll try this one. It sounds pretty refreshing to me. I want to give a big thanks to my friend, Mairi, over at Magpie Tidings for finding this ad for me. 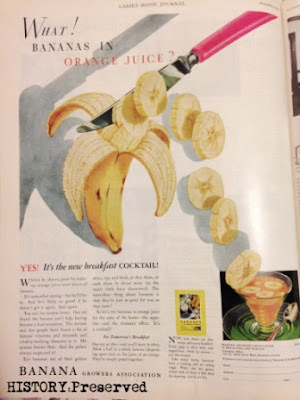 It comes from her copy of the November 1930 Ladies Home Journal. I asked Mairi for an extra close-up of the bottom of the ad, because I love finding the little recipe pamphlets that match the ad. I recently found a copy of this one, Bananas in the Modern Manner, on Amazon! I always forget to look there when I'm on the hunt. I'm really excited to get this one in the mail and will post about it soon! I just tried this - it was pretty good! I think it would be better with fresh squeezed on instead of the carton stuff with is on the tart side. And my banana needed another day or two to ripen more. But other than that - pretty tasty!